In California's Protected Waters, Counting Fish Without Getting Wet Using divers to monitor whether life is returning to the 100 or so marine protected areas is pricey. Now, advances in DNA sequencing mean scientists just need a seawater sample to do a marine census. A diver swims in a kelp forest in California's Channel Island National Park, where several of the state's marine protected areas are located. Diver Dan Abbott unloads his scuba gear on a beach in Monterey, Calif. — his tank, flippers and a waterproof clipboard covered in tally marks. He spent the morning counting fish: pile perch, black perch, blue rockfish and kelp rockfish are among the 150 fish he spotted. Abbott is diving with a team from Reef Check California, a group of volunteers doing underwater surveys by counting everything in the kelp forest in Monterey Bay. He's part of an effort to determine whether there are more fish in the waters now than there were eight years ago. 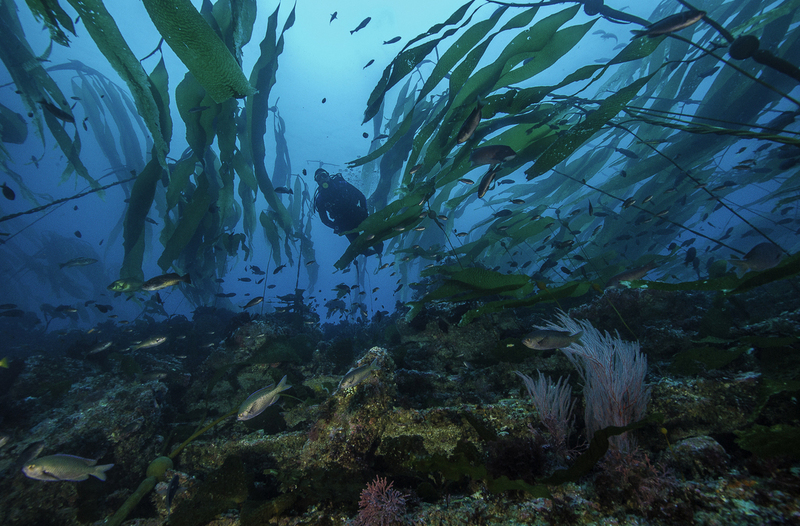 That's when this kelp forest was set aside as a marine protected area, where there's little or no fishing allowed, part of a huge experiment to restore marine life. There are more than a hundred protected areas off California, covering 16 percent of state waters, and the only way to know if they're working is for Abbott and others to keep checking the marine population year after year. These monitoring efforts are expensive. For a while, the state funded the work — to the tune of some $16 million. That money has already run out in some regions of the coast. But thanks to advances in genetic testing, scientists now have another way to count marine life, without the costly and time-consuming field work. Jesse Port, an environmental genomicist at the Center for Ocean Solutions at Stanford University, studies the environment through DNA testing — the same kind developed for human health. Port says all he needs is a liter of seawater to know exactly what has been swimming through it. That's because all organisms — whales, fish, seals — shed their DNA and leave cells behind. "Their skin, their scales, their waste — all of this gets into the water," Port explains. It's like a soup of genetic information. Port collects the cells and sequences all of the DNA. "We get 150 million sequence reads and that's a lot of information," he says. Port ends up with a spreadsheet that tells him what DNA is there. Humpback whale? Check. Rockfish? Check. Port can do this because DNA sequencing has gotten so much cheaper. One sample costs $1,500. "This was just not possible five, 10 years ago," Port says. "And sequencing technology is just going to get better, so this will probably get even cheaper." He first ran DNA tests in a large tank at the Monterey Bay Aquarium — a good test case because he knew exactly what was swimming in there. But he got back results he didn't quite believe. "Things like turkey. We picked up chicken DNA in these tanks," he says. Turns out, the poultry was in the feed some of the fish were getting. But it raised some big questions. How do you know the DNA comes from a fish or from something it ate miles away? Or how do you know the DNA didn't float in on a current? Port is still figuring these things out, but if DNA testing proves out in the ocean, it could be revolutionary. "You can cover such a larger area by taking water samples rather than having divers do that all themselves," he says. That could help California's conservation funding go a lot further — and help ensure its marine protected areas really are working.